Ok… time for a tattoo! But what to get? Maybe a traditional navy style anchor on the forearm… nahh!! How about one of those very kewl tribal tattoos all the guys are getting…? Nope!! OH! Eureka! I have it! 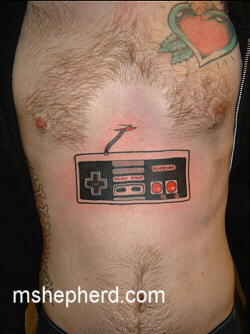 I’ll have an enormous Nintendo Paddle placed across my sternum in permanent ink. And just for giggles, I’ll have it done as to give the impression the cord is imbedded in my chest! That should impress everyone! Gross!!!! talk about a bit too much!!! Can you imagine how many young impressionable mind would think this is soooo cool. I guess I am too old to think this is cool!! Is 41 old????? You’ve lived 15thousand times longer than the average housefly. That tatoo you have put on your chest is stupid! In my country, Mexican peoples think you Americans are obsessed with permanent ink on the skin. When will this fad end?